Wu was born in Liu Ho (near Shanghai), China, in May 1912 (although some sources say 1915, and others 1913). Until age nine, she attended a school for gifts operated by her parents and then transferred to a private high school, where she became politically active. After graduating as valedictorian in 1930, she matriculated at the National Central University in Nanking and four years later received a degree in physics. 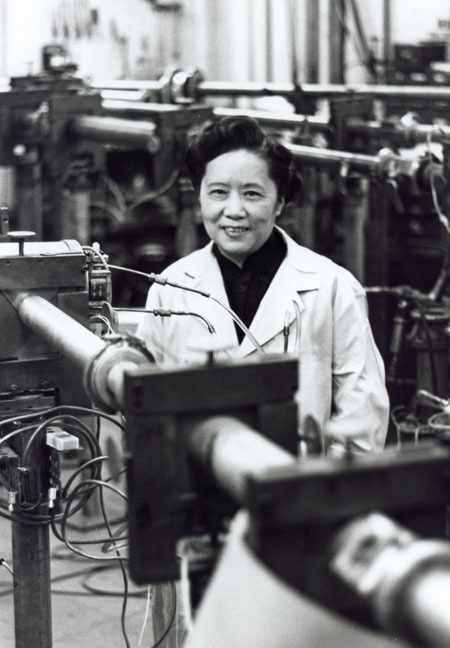 Wu crossed the Pacific in 1936 and began graduate studies at the University of California, Berkeley, where she worked under Ernest Orlando Lawrence, inventor of the cyclotron, a device that accelerates and smashes nuclear particles. The university granted her a Ph.D. in 1940 and then hired her as a research assistant. From 1942 to 1944, she taught at Smith College and Princeton University, and finally started a long­ term post at Columbia University, New York, in March 1944. Her first duties were war related; she joined the Manhattan Project, the program aimed at building the first atomic bomb. In 1945 Wu became a research associate at Columbia; in 1952 she was promoted to associate professor, and in 1958 she attained the level of full professor. Wu’s most important work occurred in 1957. She had become proficient at experiments involving beta decay, a radioactive transformation of atoms in which beta particles are ejected from the nucleus. Because of her expertise in this area, she was approached by her colleagues Chen Ning Yang and Tsung ­Dao Lee after they had formulated a revolutionary theory concerning parity. Parity refers generally to the symmetry, or the absence of a bias in direction, of the physical laws of nature. Prior to 1956, physicists thought that parity is conserved in all nuclear reactions; with respect to particle emission, this means that the emitted particles in a given reaction are emitted in all directions equally. In 1956 Yang and Lee found theoretical evidence suggesting that parity is not conserved in certain weak interactions of the nucleus, for example, those associated with beta decay. Wu immediately began testing this hypothesis, using the beta decay of radioactive cobalt­60. In 1957 she showed experimentally that when these cobalt atoms are placed in a magnetic field, more beta particles are emitted in the direction opposite the magnetic field than in any other direction. Thus Wu proved that parity, in this case the symmetrical emission of beta particles, is not conserved. She received numerous awards for this accomplishment. Later in 1957, Yang and Lee were awarded the Nobel Prize for Physics for their work on parity; some observers have commented that Wu should have been included in this honor. Wu subsequently provided experimental confirmation of two other theories of nuclear physics: the conservation of a vector current in beta decay and the release of electromagnetic radiation upon the collision of an electron and positron. Wu’s confirmation that parity is not always conserved represented a revolutionary step in the field of nuclear physics. Her contribution was all the more important as it enforced the fact that women could make influential contributions to science, particularly in the field of nuclear physics, a field dominated by men. By the 1950s, the conservation of physical properties was an integral element of classical physics. It had been demonstrated that important physical properties of particles, such as mass, energy, momentum, and electrical charge, are the same before and after a nuclear reaction. The non conservation of parity forced physicists to rethink some basic assumptions and was also valuable in explaining some otherwise puzzling experimental results in nuclear physics. Wu’s work stimulated research in the progressive investigation of symmetry, pursued by influential physicists RICHARD FEYNMAN, MURRAY GELL­MANN, Robert Marshak, Ennackel Chandy, and George Sudarshan. Posted on March 10, 2015 by Natalie. This entry was posted in Researchers. Bookmark the permalink.